Origami, which has the ability to fold a large scale surface to a much smaller one, has drawn more and more attention from mathematicians and engineers. 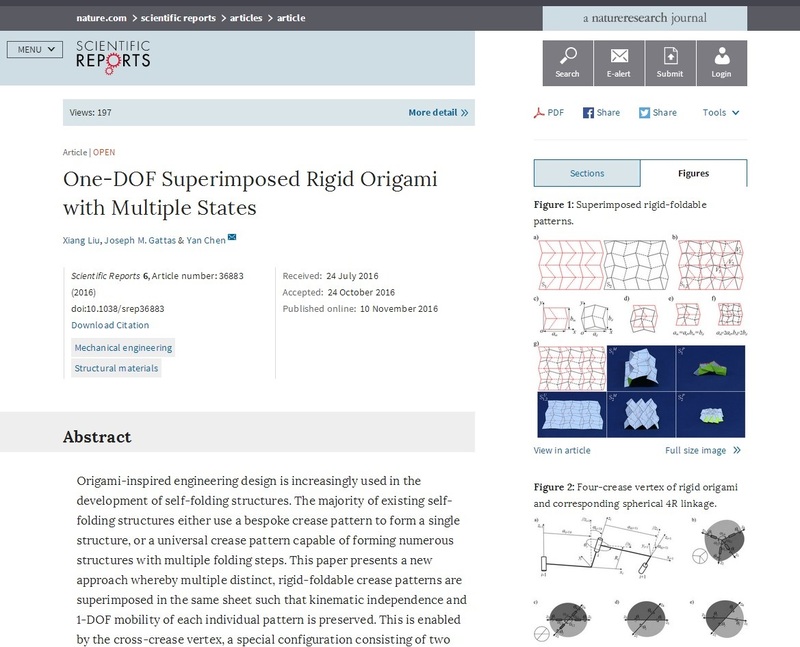 Recently, Professor Yan Chen and her team published their research about multi-states origami morphing structures on Scientific Reports, an online, open access journal from the publishers of Nature with an impact factor of 5.228. The team developed a novel method for generation of multiple rigid-foldable configurations from pre-defined crease patterns. The method leverages the existing knowledge surrounding rigid-foldability to enable crease patterns of different 1-DOF rigid-foldable states to be embedded within a single sheet, such that kinematic-independence is preserved. Sheets can thus be created that contain multiple states with different or complementary functionalities and substantial potential for applications in origami-inspired engineering designs. Besides, the research unveiled that not only could two patterns be merged, the folding sequence is switchable, giving the possibilities to be used to construct programmable meta-materials. Professor Chen’s MSC student Mr. Xiang Liu, was awarded 2016 National Scholarship of master students for his contribution in the research. More information please visit: http://motionstructures.tju.edu.cn/.